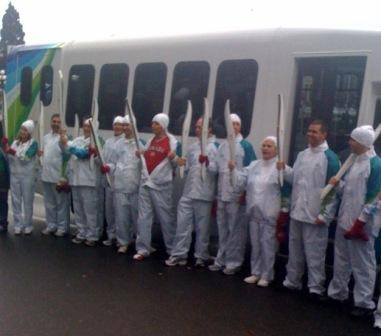 Live, from Victoria, B.C., it's ... the 2010 Olympic Torch Relay! 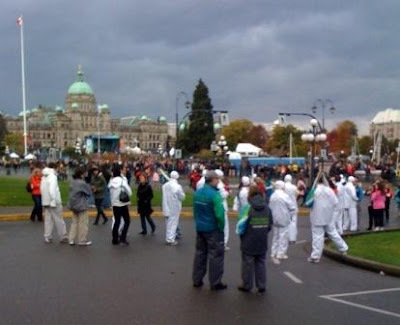 With thanks to my colleague Shari Burnett, the photo with this post is from behind the scenes at this morning's arrival of the Olympic Flame from Greece to the Province of British Columbia. Looks like the torchbearer process is similar in 2010 to that of 1996 (and Olympic torch relays since). The runners in the photo are lined up in uniform before boarding their shuttle to be dropped at their designated spots for running duty.